If you are looking for a holiday away from the main tourist centres, then this rural cottage is for you. It is one of a collection of 4 little houses, that complement perfectly the surrounding countryside. Situated in the Valley of Orotava in an area of farmland, the cottage enjoys spectacular views of the sea and mountains, the Nature Park Chanajiga and the Slopes of Tigaiga. The cottage is situated halfway between the village of Las Llanadas and Los Realejos and is just 20 minutes from the beaches at Puerto de la Cruz, Garachico or Icod de los Vinos and 35 minutes away from the nearest country golf course. 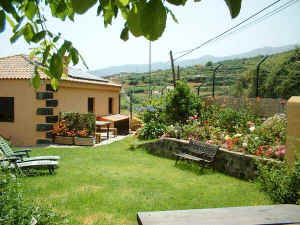 Casa el Ciruelo was originally an old farmhouse, which has been refurbished recently in a traditional Canarian style. The interior has been carefully decorated, incorporating exposed stonework and timbers and consists of a lounge with television, kitchen/dining room, bedroom, bathroom and outside terrace. The kitchen equipment includes a hob, coffee machine, juicer. The cottage is well equipped and welcoming, making it a perfect retreat for a relaxing holiday. A cot can be provided if requested. The fully equipped kitchen includes a washing machine and fridge. Heating is provided. There is a barbeque and jacuzzi available and ample parking. There is also a cot available. The cottage is 88km from Reina Sofia Airport and 28km from Los Rodeos Tenerife North Airport. The nearest restaurants and the supermarkets are 2km away and the nearest beach is 9km. If requested the owners can provide a welcome pack of selected items, which can be left in the kitchen before guests arrival.